Each year we address the current concerns that girls are facing in terms of self-confidence, exploring tools for success, understanding parents, thinking about positive role models, and finding a purposeful future leading to happiness in life. This program attracts 100 girls each year from Rockland County schools. All girls in grades 7 through 12 are welcome to attend and become more empowered! This year’s event will take place at the Finkelstein Library, Fielding Room at 24 Chestnut Street in Spring Valley NY on Saturday April 6th, 2019 from 1:30 to 3 pm. Doors open at 1 pm and admission ends at 1:30 pm. We cannot admit younger siblings. MHA is excited to welcome Susanne Rios as the Team Leader of the Mobile Outreach Team! Susanne is licensed in Family and Marriage Therapy and a Certified Daring Way Facilitator, which is a highly experiential methodology based on the research of Dr. Brené Brown. The method was designed for work with individuals, couples, families, work teams, and organizational leaders. Susanne has been practicing since 2006 and just joined MHA after moving from Fairbanks, Alaska where she was a Military Family Life Counselor and Manager of Child and Family Life at a community mental health facility. Susanne is an engaged mom of 3 children and is excited to be back working in the mental health field! In 2016, MHA of Rockland was awarded an exclusive grant to work with people who had long-term inpatient psychiatric hospitalizations to regain a sense of independence through community integration, resource development and residential supports. The Mobile Outreach Team (MOT) receives referrals from Rockland Psychiatric Center for individuals who are currently an inpatient but beginning their hospital discharge process. We support individuals all the way from discharge planning to re-establishing community connections and to living independent and self-directed lives. In general, MOT helps people live more independent and self-directed lives. · Assisting in developing daily living skills—shopping, meal preparation, cleaning, personal hygiene, etc. In 2016 MHA Rockland was awarded an exclusive grant to work with people who had long-term inpatient psychiatric hospitalizations to regain a sense of independence through community integration, resource development and residential supports. From our MHA family to yours: we wish you peace, love, and prosperity in the coming year. May your days be filled with joy and contentment. Thank you for all you do and all you are on our journey as we connect people, educate families and rebuild lives. 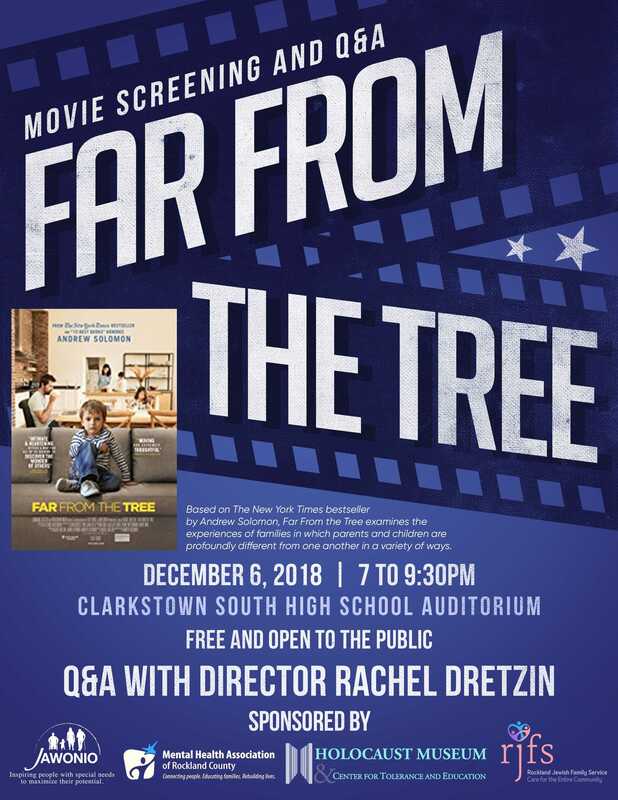 MHA, in collaboration with The Holocaust Museum & Center for Tolerance and Education, Jawonio and Rockland County Pride Center, is hosting a movie screening of Far From the Tree, a film which examines the experiences of families in which parents and children are profoundly different from one another in a variety of ways. We invite you to join us on December 6 from 7:00-9:30 pm at Clarkstown High School South for a screening of this beautiful film based on the New York Times bestseller by Andrew Solomon. There will be a Q & A with Director, Rachel Dretzin, following the screening. This event is FREE and open to the public. We hope you will join us on December 6th for the movie screening of this great film! For more information about this event, contact Velvet Reda at extension 257.